Vacation time had arrived at last, and this summer, I planned to return to the Panhandle for three paddles. It was long overdue—I had originally scheduled it for July, but I fractured my wrist (handstands) and had to delay my trip. My cast came off Friday, two days before I left for the Panhandle. I figured a few days of paddling would be good therapy. 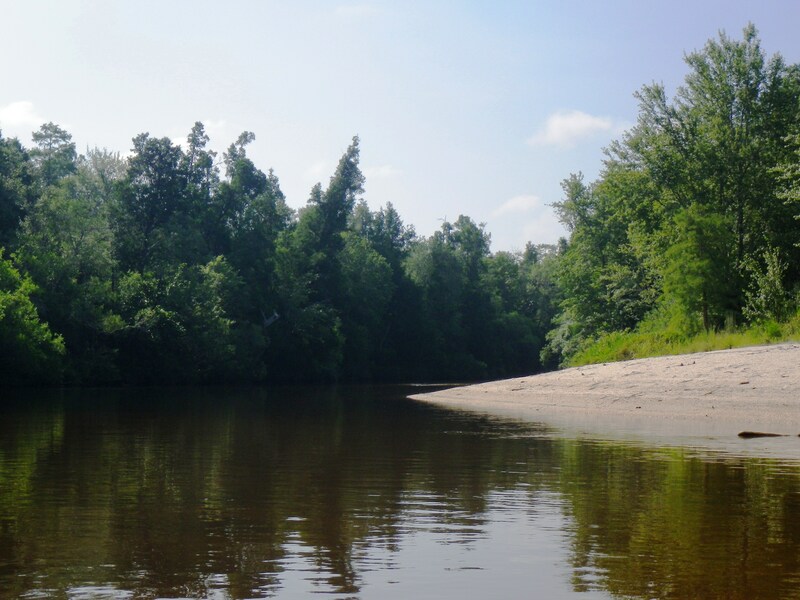 I chose the most westerly river I could for my first paddle: the Perdido River. In Spanish, Perdido means, “lost” or “lost river.” If you look at the map, the Perdido River draws the north-south boundary between Florida and Alabama, and there is so much history here as the Spanish, British, French, and of course, United States, struggled to gain possession of these lands. (Boning) The Perdido originates in Alabama and travels about 58 miles from Alabama to Perdido Bay—which is part of the Gulf. It includes nine miles of Florida Designated Paddling Trail from Barrineau Park to Adventures on Perdido. The Perdido is also an Outstanding Florida Water. Adventures on Perdido (formerly part of Adventures Unlimited) is the only outfitter on the river. Linda and Dave are the owners; theirs is a small mom and pop outfitter in the middle of nowhere. They have enough canoes to meet the needs for busloads of vacationers, but I found the choice of kayaks limited. A sit-on-top would have been nice under the hot sun (and Linda’s recommendation), but theirs were too small to hold my cooler and supplies, so I opted for a sit inside. As it turned out, it had wacky tracking, and whenever I stopped paddling, the kayak turned right–a bit like that crazy cart I sometimes get at Publix. At 9:30 a.m., Dave dropped me at the Perdido River Wildlife Management Area access, just south of Barrineau Park. From here, I paddled south with Alabama on my right and Florida on my left—how cool is that? I spent the next three hours alone on the tea-colored waterway under the hot August sun. The wide river (often about 50 feet wide) and tall palms, cedar and cypress offered little shade! I made do with the sit inside kayak and flung my legs over the sides—not very ladylike, but it was very relaxing and much cooler with my feet dipped in the water. The river was quiet—no people, no animals, no gators or snakes. Three hawks flew overhead and disappeared. I took in the beautiful white sandbars and the high sandy banks while I snacked on trail mix and fruit. However, as beautiful as these all were, the condition of the river was disappointing. Dead wood in the water collected trash all along the river—reminders of inconsiderate humans. Although the Perdido Wildlife Management Area includes 15 miles of frontage on the river, portions are also owned by individuals (evidenced by many plastic chairs on sandbars) and gun clubs. I wondered who was responsible for keeping it clean. This river had so much potential, but it seemed neglected. Truthfully, I can’t say that Perdido makes my “top ten” list. 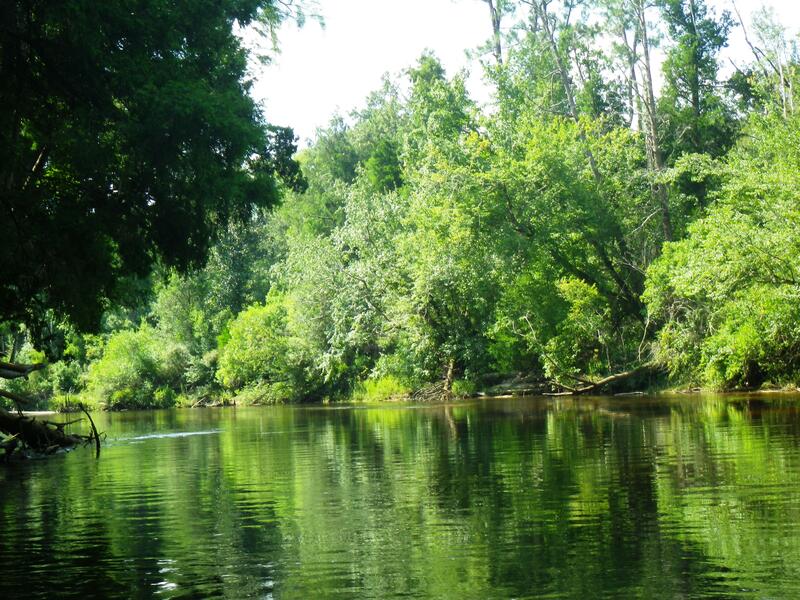 However, is there anything better than to paddle down any Florida river in the midst of nature?